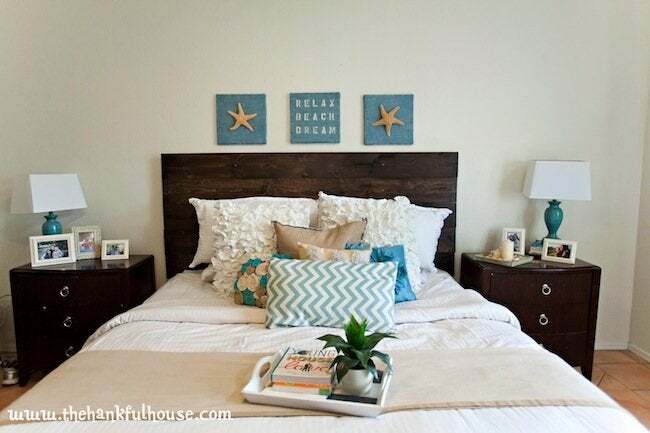 This bedroom gets a beach-inspired look with the help of a new headboard. 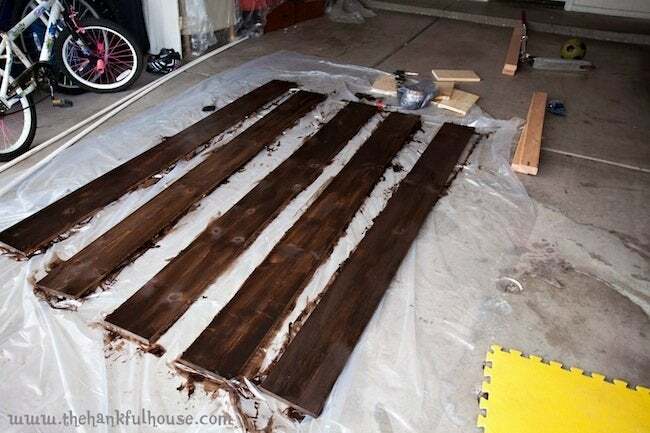 We love it when home DIYers aren’t afraid to work with wood and stains. So when we saw this project from Mandy at The Hankful House, we knew we wanted to give it a spot in the Bob Vila Thumbs Up competition. The transformation from before to after was so incredible, we didn’t even recognize the room—always a good sign. And for us, it all starts with this headboard, which anchors the space. Read on to see how Mandy did it. I have never had a headboard. I have always been a box spring and mattress kind of gal. Not that I had anything against headboards it was more of a money issue. But it’s like being able to purchase that amazing and beautiful yet really expensive accessory. That was the headboard. I knew we needed it to finish off our bedroom so we made it. 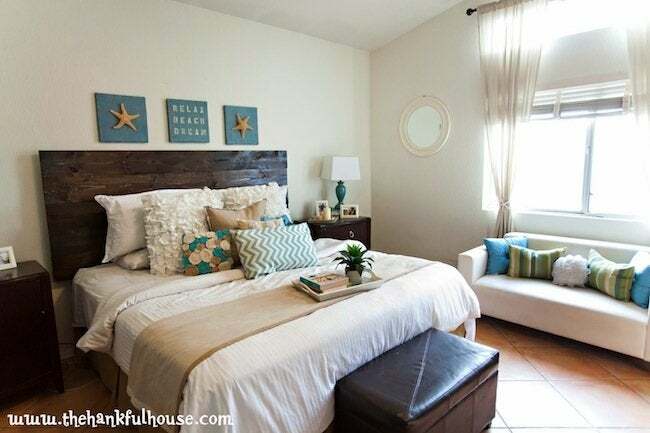 I wanted some rustic-ness to come in to match our beachy but not really beachy themed room. Does that make sense? There is something so elegant about natural materials. It cost me about $70.00 or so, which wasn’t that bad. We had to buy the longer planks because our bed is so large. We had the Home Depot guy cut the wood to our length there so I wouldn’t have to listen to my husband complain. Seriously it worth hanging out at the store for a few more minutes. I brought them home and stained them. I did want them pretty dark to match our furniture so I gave them 2 heavy coats and didn’t rub any off. I will tell you it did take a few days for them to dry completely. If I had done this in August, the boards would have been dry in 5 minutes. Once they were dry we placed them together and Mike screwed in 2×4’s to the back for support. We attached those to the wall for extra support and that was it. It is beautiful and I am in awe! This was our before picture—the colors were just all wrong! Nothing relaxing about this room at all. Plus I still can’t believe Mike and I slept under 100 ton rod iron candlestick holders, what was I thinking? What a difference our bedroom has now! I am so happy with our transformation and I got to cross off a few more projects for this room! Yeah! It’s almost done! Thanks for sharing, Mandy! 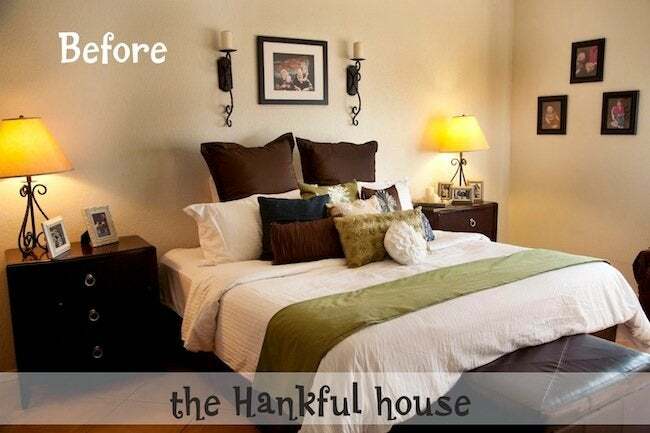 To take a tour of the whole master bedroom and bath, or see even more incredible DIY projects, visit The Hankful House.